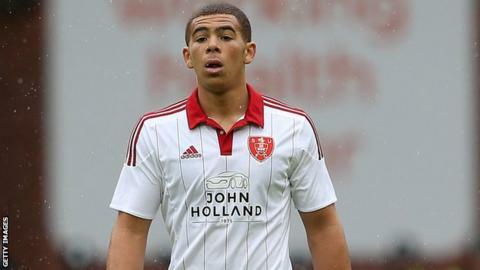 Che Adams scored twice as Sheffield United claimed a closely-fought victory over Rochdale at Bramall Lane. Adams' fine run gave the home side the lead, before Matt Done conceded a penalty that Dale forward Peter Vincenti hammered home. The Blades went back in front before the break as Adams slotted in Billy Sharp's excellent cross. Lewis Alessandra brought the scores level but a curling corner from Neill Collins secured United three points. Adams came close to a hat-trick in the final minute of the game as he charged through the midfield, but his powerful shot was well saved by Josh Lillis. "They're a big football club playing in League One football and you need everything to go right for you, to win and get something from these places and unfortunately we made too many mistakes. "If you look at the attacking portfolio of players that they've got, they're difficult to contain. "I thought we did that very well in the first half up until the goals. For us to be 2-1 down at half time is very disappointing." Match ends, Sheffield United 3, Rochdale 2. Second Half ends, Sheffield United 3, Rochdale 2. Attempt saved. Che Adams (Sheffield United) left footed shot from the centre of the box is saved in the bottom left corner. Corner, Sheffield United. Conceded by Scott Tanser. Attempt missed. Matthew Lund (Rochdale) right footed shot from outside the box is too high. Matthew Lund (Rochdale) wins a free kick in the attacking half. Attempt blocked. Reuben Noble-Lazarus (Rochdale) right footed shot from outside the box is blocked. Goal! Sheffield United 3, Rochdale 2. Neill Collins (Sheffield United) header from the centre of the box to the top left corner. Assisted by Jose Baxter with a cross following a corner. Corner, Sheffield United. Conceded by Jimmy McNulty. Substitution, Sheffield United. Louis Reed replaces Paul Coutts. Goal! Sheffield United 2, Rochdale 2. Lewis Alessandra (Rochdale) left footed shot from the left side of the six yard box to the bottom right corner. Assisted by Nathaniel Mendez-Laing. Attempt blocked. Matthew Lund (Rochdale) right footed shot from outside the box is blocked. Substitution, Rochdale. Scott Tanser replaces Tom Kennedy. Attempt missed. Peter Vincenti (Rochdale) header from the centre of the box is close, but misses to the right. Che Adams (Sheffield United) wins a free kick in the defensive half. Attempt saved. Matthew Lund (Rochdale) header from the left side of the box is saved in the top centre of the goal. Corner, Rochdale. Conceded by Neill Collins. Attempt saved. Reuben Noble-Lazarus (Rochdale) left footed shot from outside the box is saved in the centre of the goal. Paul Coutts (Sheffield United) wins a free kick on the left wing. Reuben Noble-Lazarus (Rochdale) wins a free kick in the attacking half. Billy Sharp (Sheffield United) wins a free kick in the attacking half. Foul by Oliver Lancashire (Rochdale). Substitution, Rochdale. Reuben Noble-Lazarus replaces Donal McDermott. Attempt saved. Jose Baxter (Sheffield United) right footed shot from the right side of the six yard box is saved in the bottom right corner. Kieron Freeman (Sheffield United) wins a free kick on the left wing. Foul by Lewis Alessandra (Rochdale). Corner, Rochdale. Conceded by Kieron Freeman. Second Half begins Sheffield United 2, Rochdale 1. Substitution, Sheffield United. Kieran Wallace replaces Jay McEveley because of an injury. Substitution, Sheffield United. Harrison McGahey replaces Stefan Scougall because of an injury.